Last year, I bought a copy of Political Participation in Britain (Paul Whiteley, 2012). On page 86 there is a graph (bear with me…) of responses to one of the questions from the British Election Study Continuous Monitoring Survey. This study asks 1000 people a month their views on a variety of political issues. 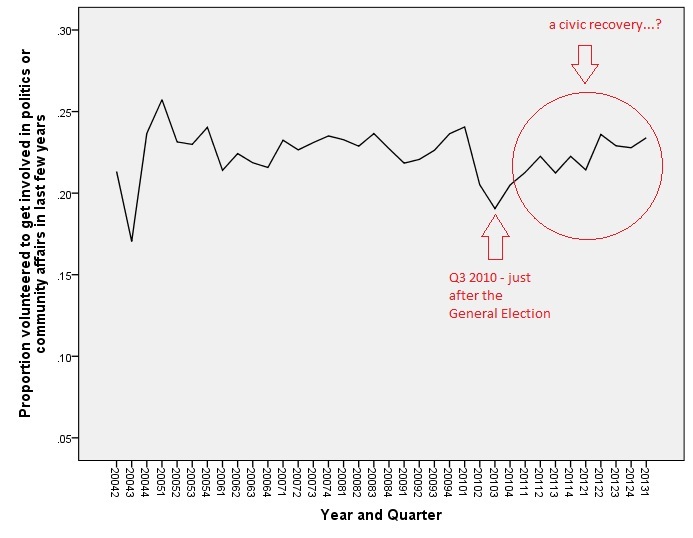 This particular question reads: “Over the past few years, have you volunteered to get involved in politics or community affairs?” Whiteley describes “a slow but noticeable decline” from April 2004 to December 2010. He writes: “It is no coincidence that this was the beginning of the worst financial crisis and recession in eighty years, suggesting that the state of the economy has an influence on social capital”. At the anniversary of the London Olympics, I wondered whether the The Games could have made a difference to how involved people get with their communities, so I went back to the data to bring the graph up to date. Before we go too much further into unpacking some of this, I’ll show you my version of Whiteley’s graph. He uses monthly data, while I collapse mine to quarters; his stops at the end of 2010, whereas I now have the data up until the end of Q1 2013. I also annotated mine with pretty red arrows. There are quite a few things here that need more thought. First up, I don’t see an obvious Olympic dividend. The pick-up in civic activity began well before the Olympics. 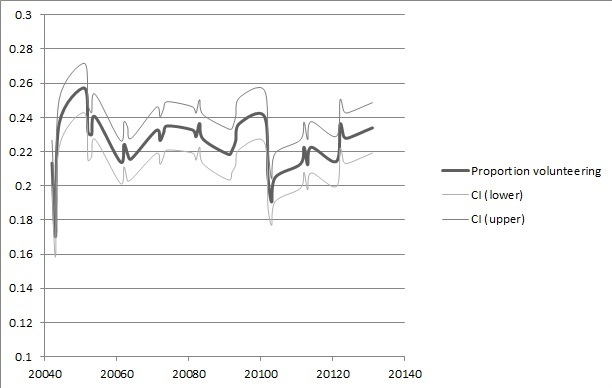 Secondly, Whiteley claimed that the data he used (up to Q4 2010) showed a “noticeable” decline. Looking at it now, with the 2011 and 2012 data, I’m not at all sure that’s the case. Hell, even if you put your hand up to the screen to cover the later data, I’m not sure you’d really describe the decline as particularly “noticeable”. Thirdly, look at the question on which the graph is based: “Over the past few years, have you volunteered to get involved in politics or community affairs?” What’s this really asking? “Over the past few years” is such a woolly timeframe that this is more of an attitudinal question than an activity question. My best guess is that the question stands for ‘Would you get involved…?’ more than it stands for ‘Did you get involved…?’. So what about the last segment of the graph? It looks as though people got more enthusiastic about getting involved in politics and community affairs sometime shortly after the last General Election. As far as I’m concerned the jury’s still out, but it certainly seems to suggest a political driver, rather than Whiteley’s economic driver, for the change in responses to this question. I wonder (and I’m whispering very quietly here), could the Big Society have anything to do with this…? EDITED 26/7/13: After a tweet from @karlwilding, I plotted the confidence intervals for the means in the graph above. This one was done in Excel and has ended up looking less spiky, but it’s the same data. The eye is now drawn much more to the dips than to the peaks: if there’s anything here to explain at all, it now looks as though it’s in the 2010 and 2004 troughs. This entry was posted in Academic research and tagged Big Society, civics, data, engagement, volunteering. Bookmark the permalink. 2 Responses to A civic recovery? Or a graph of er… something-or-other. There’s a lot of jumps here, surely. Firstly, the question is retrospective, but you’re right to suggest it’s as much attitudinal, but the idea that it’s _really_ a question of intent isn’t supportable. The survey asks whether people have undertaken activity in the last few years. And they report in the months following a GE that they’ve done less. Of course they do – everyone is wounded. Those people who have done activity don’t wish to acknowledge it (there’s a well-observed phenomenon that opinion polls just after elections show more people voting for the winners; this could easily be the converse; more people not wishing to acknowledge that they worked their backsides off and lost. Then there’s the Lib Dems who wish to expunge their role in helping things turn out the way they did from memory. In other words, it seems like a proxy for ‘how do you feel about your involvement in politics now’ rather than ‘how do you feel about being politically involved in the future’. Secondly – and far more importantly – if this is a 1000-person survey, we’re talking about changes between 2-2.5%, which is to say ‘what 5 people thought at this time’. That’s pretty small, as survey samples go really. Well, it’s 3000 people a quarter (1000 a month) and you’re trying to explain changes of about 5%, so it’s not quite that bad… Take your point, though – not great either! I actually don’t think there’s much here. Most evidence shows pretty steady volunteering rates (at different levels depending on what question you ask, and the context in which you ask it) – and I don’t think this really shows anything different. I like your take on the attitudinal question. It’s a terrible question, really.